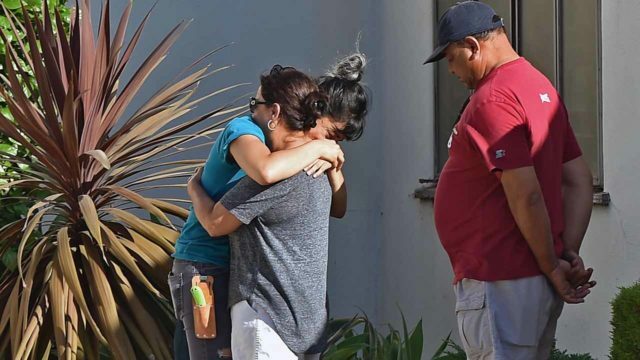 A gunman took hostages inside a supermarket in Los Angeles on Saturday after a gun battle with police, leaving a store employee dead before the suspect handcuffed himself and surrendered, police said. The drama began at another location when a man became “involved in a family dispute which resulted in him shooting his grandmother and a female,” Sergeant Barry Montgomery told journalists. “That suspect fled the location in his grandmother’s vehicle, taking that female victim with him,” and eventually entered a Trader Joe’s supermarket in the Silver Lake neighborhood, he said. While police chased him, the suspect “fired on officers multiple times” before an “additional gun battle” outside the Trader Joe’s, Los Angeles Police Chief Michel Moore told reporters. “Inside the store a young woman was shot and killed,” Moore said, adding that officers rescued her but she could not be revived. There were contradictory reports about whether the victim, whom US media identified as store employee Melyda Corado, was shot by the gunman or in the crossfire with the police. The gunman took “numerous victims, of citizens as well as store employees, hostage,” the chief said. Officers freed some workers and customers, while the hostage-taker released others himself. About three hours after the ordeal began, negotiations led to the man “handcuffing himself and coming outside and surrendering to SWAT officers,” the police chief said. During the earlier shootout the suspect was wounded in the arm, Mayor Eric Garcetti said. The incident injected chaos — and scores of police and fire vehicles — into the busy commercial area of shops and apartment buildings. Don Kohles was standing outside the store when the suspect’s car slammed into a pole. Then Kohles heard two shots. He ran into the exit door of the Trader Joe’s, looked back at the street and saw two police officers shooting at a man, he said. “The bullets were flying everywhere — through the front of the store and across the parking lot,” Kohles told the Los Angeles Times. Devin Field, who said he was walking into the store when the incident unfolded, described his experience in a series of tweets. “I was walking in when a car… running from the police crashed into street lamp in front of the entrance. Gunman got out and started shooting at the cops. I hid behind a retaining wall with three cops until they had me crawl out,” wrote Field, whose Twitter account identifies him as a writer for the TV show “Jimmy Kimmel Live”. “Gunman walked in shooting. He went into the back and took hostages. Employees snuck out through back emergency exits. Employee says blood was all over the floor, unclear from where,” he wrote.